PkMotors.com: Buy used cars, sell used cars online in Pakistan. Cars website. If you're one of the pakistani buying a used car, you are probably among the many who will experience the anxiety that goes with it, not to mention the pressure and lack of trust often associated with dealerships and some people trying to hide original facts about the car they would like to sell. Buyers should be ready to examine vehicles using an inspection checklist. When you decide to buy a used car in Pakistan, first find out the model, which best suites your wallet and your needs. You should also think about what kind of vehicle you would need depending on size of your family, mood of driving, road conditions in your city etc. A . How will the car be used ? B. Who will be driving this car ? C. What feaures best suit your needs ? D. How much you can afford to spend ? These few basic car maintenance tips and checklist is given here for ease of car user and the better performance of the cars. 1) Dealer's margin on a new car is basically fixed, but you never know what he actually paid for the used car he's offering you. 2) It is difficult to bargain with a dealer. An owner may make a better deal to dispose his vehicle compared to a dealer who is more interested in getting good commission on top of price. 3) A dealer is expert in selling cars daily. He may be smart in selling than you are smart in buying. Example: He may manipulate your deicision by saying 'I've got several people interested in this car, so make a quick decision" Don't be pressurized. A similar or better car at a price that is in your budget will always be worth the wait. Educating yourself through our free check list and tips and tricks you search for a car will helpyou avoid marketing ploys and deceptive owners or dealers. When you go to check a used car in Pakistan, it is always good idea to go during day time. Still take a flash light with you and wear clothes that you will not mind getting dirty. Make sure that the mileage of car is not tempered with. Doing from 15, 000 km or 20, 000 km is considered a good mileage and not over used vehicle. Check the odometer, if the numbers are out of line the mileage may have been altered. Checking worn brake pedal and wear marks on the gear handle indicate that a car that might have done more than 80,000 kilometers. Take a good look at the overall condition. Make sure that the engine clean, or if there are signs of leaking oil or other fluids? Keep in mind these conditions and check them again after taking a test drive. Go down the car and take a note if it is dripping any thing. Check it again after test drive. 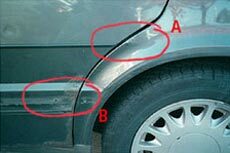 Look for corrosion or rust on body of car specially if the car has been ued in Karachi. Rust is probably the most damaging thing of all on cars over six years old. Make sure there is no rust at the top and rear of the front wings, along the side sills, below front and rear bumpers and the bottoms of the doors of car. Some times a car suffering from rust may be filled with plastic material to conceal the rusty parts. Take a small magnet with you, it will be attracted to metal but not to plastic body filler. Similarly try to look for variation in color because a plastic filling must be covered with new paint. If you find a denting or patining done, or if seller lets you know about it, don't forget to check the details of repair including the receipts and work shop from where it was done. A car that has been in a collision can be dangerous, especially if its suspension and/or steering have been damaged. Look under the carpet between the front and back doors for signs of welding or repair. If possible have a mechanic put the car up on a lift for inspection and to check for accident damage. Looks are one thing, but never ignore safety. Never buy a car without test driving it yourself. Take it on a drive that covers a mixture of conditions i.e. fast motorway driving, slow urban driving, twisting roads and don't forget to check reverse. When test driving the car the steering should be consistent with no tendency to pull either left or right. Keep an eye on temperature guage if you get a chance for longer drive. This may indicate any over heating. If the car has a manual gearbox, check the clutch operates smoothly and all gears engage easily. Check shock absorbers by putting your weight hard on the bodywork at the corners and letting go. The car should rebound once just past the level position, then go back resulting in one and a half swing. Any more than this indicates the shock absorbers are worn out. Check the treads and side walls of all the four tyres of the ca. 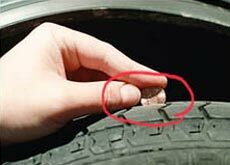 There should be more at least 2 mili meter of tread all over the tyre and the sidewalls should not be cracked or damaged. How a vehicle is equipped also affects its value. Are the seats upholstered in leather? Is there a CD player? Is it equipped with air conditioning? Don't hesitate to test all the lights and signals, inside the car and outside. Same thing for the wipers, heat and air conditioning, and cigarette lighter. Check the engine plate on the car corresponds with that given on the registration documents and make sure that it has not been tampered with or changed in any way. Make sure that the seller is the real owner of car. Match the registration book with ID card of the seller. It is recomended to go for a car with single owner. If the car's asking price is well below market value, find out why. Most car sellers in Pakistan will not be willing to sell a car for 5 Lakh that has market price of 6 Lakh. If they are, there must be some reason. When you pay always request a receipt that includes all the pertinent information. It is not good to make a deal at the same time. The excitement or any other factor may result in bad deal. According to experts, our brain processes information unintentioanlly and even during sleep. So collect all your information and go home and review it. Give some time to your brain to process all information and then call the seller to make a deal. 1) Why are you selling the car? Check if the seller gets nervous with this question. 2) Without letting the owner look in to the mileage meter, ask him how many mileage are there. If you are first buyer, he might have forgotten how much mileage he has tempered or simply said "Ustaad jee ! Mileage thallay kar diyo.... waichnee hai"
3) Was the vehicle ever involved in an accident? Most critical question. Vehicles that have been in collisions are prone to more problems. 4) Ask if he is looking to get rid of it quickly. This may help you in negotiating a better deal or a reason for quick selling due to any problem. 5) What is the price, and if it is negotiable. 1) It is always good deal to buy a one or two years old car that has been decently used. You may get almost new car in Pakistan by paying much less than the price of new model available in market. 3) Checking the Engine oil can help you indicate how seriously and regularly car owner has been maintaining it. 4) Many Rent a car services may advertise a car to be in personal use by selling it through friends or relatives. 5) Some cars suddenly increasing RPM (more than normal) after starting may indicate problem in car engine or was heating up on last ride. 6) According to our research, men can settle at a lower price compared to women. 7) New cars or some imported cars now in Pakistan are equipped with air bags. Beware of used air bag fraud. Meaning, an air bag that was used in accident or just for fun, but it does't work when its your turn. 8) It is recomended to buy a car from Islamabad if you are sure it has been used inside Islamabad. This city has better road conditions compared to any where else in Pakistan. This may help you in not buying an over heated, or rough road driven car. 9) Many people think digital odometers (that tells mileage of vehicle) cannot be rolled back. Please know that it is based on a chip just like your mobile sim. In Pakistan, now it is possible to re-program it or replace it with a low mileage. 10) Be sure to make deal along with accessories. Once you hand over token money to buyer, he may start removing accessories claiming that these were not included.